I have a passion for vintage cosmetics ephemera and vanity accessories, and it’s not always the easiest collection for people to comprehend. A friend has referred to my assortment of stuff as “cosmeticana” — which I think suits it perfectly. I’ve been collecting for years and have more than 500 items. It’s become more challenging to find items now than when I first began to collect. I go to fleamarkets and estate sales, and I frequently scour online sites for the perfect Art Deco face powder box, or a rare hairnet package. I also have a passion for books, history, crime, film noir, and vintage clothing. I am a writer and have been a regular contributor to 1947Project.com, OnBunkerHill.org, and an occasional contributor to InSROLand (insroland.org). On most Saturdays I am a tour guide for the Los Angeles based company Esotouric. Esotouric offers off-beat bus tours covering everything from the various uses (and abuses) of public space in Los Angeles, to writers such as Raymond Chandler and James M. Cain. Whenever I can I volunteer as a docent for the Los Angeles Conservancy giving tours of Union Station. I’ve written and given walking tours of downtown Los Angeles for private groups such as the Getty, and the Los Angeles Athletic Club. I delivered a lecture at the Queen Mary Art Deco Festival in 2006 entitled, “Deco on the Dressing Table”. On February 20, 2010, I gave a lecture at the Egyptian Theater in Hollywood entitled “Hair Today, Gone Tomorrow: How the ‘Bob’ Changed History”. The lecture was co-hosted by Los Angeles Art Deco Society, and American Cinematheque. I am currently involved in organizing the archives of Police Daily Bulletins at the Los Angeles Police Historical Society. I am a board member for Photo Friends, which is a nonprofit, all-volunteer organization dedicated to preserving and promoting the Photo Collection of the Los Angeles Public Library. I’m also on the board of the Art Deco Society of Los Angeles. In 2010 I appeared in a segment on film noir for the Turner Classic Movies series Film Fanatics. I also appeared in an episode of the ID Discovery Channel’s series Deadly Women . In the segment for Deadly Women I was interviewed about the 1953 murder (in Burbank, CA) of Mrs. Mabel Monahan by Barbara Graham. Graham was one of only four women ever executed by the State of California. Graham’s story was made into a 1958 film, I WANT TO LIVE, which starred Susan Hayward. My ephemera collection is comprised of items such as cardboard face powder boxes, hairnet packages and magazine advertisements from 1900-1950. It was the beautiful art that drew me to the items, and it is why I continue to add to my collection. The artists were frequently hired by the cosmetics manufacturers to develop advertisements and containers for their products. Most of the artists remain unknown to us – but their work is still exquisite. There were some famous artists who became involved in the design of cosmetics packaging — most notably Rene Lalique who designed the gorgeous Coty face powder box with the powder puff design. 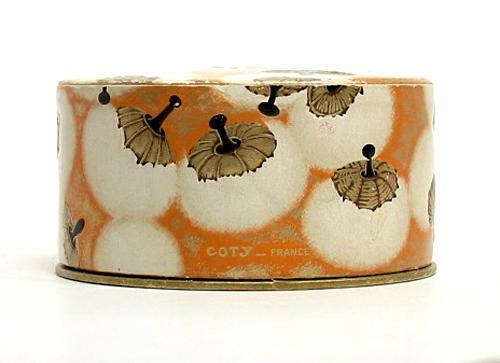 The Coty box and powder are still in production today. If you want to own a piece of cosmetics history you can buy one of the boxes for just a few dollars at your local drugstore. When women first began to powder their noses in public, and to apply lipstick, eye shadow, and rouge it was up to cosmetics companies to get their attention, and their dollars, with advertisements and packaging. The advertising and packaging of cosmetics left a rich legacy of design. It is amazing how many of these beautiful and fragile items have survived – some of them for more than 100 years. Rather than discard the face powder boxes, women frequently held on to them. During the years of the depression when beautiful things were hard to come by, for a few cents a woman could go to the drugstore and purchase face powder, lipstick, or a compact. Once the product was long gone, many women kept the containers and used them to hold safety pins or buttons. Collecting face powder boxes and beauty ephemera is not only a fascinating hobby, but it opens up a window into the past. By using items from my collection as a point of departure, I will examine the lives of women from 1900-1950; but, beyond that, I believe that individual items will suggest topics which may include the art and design of the container or advertisement; film noir; fashion and cosmetics giants such as Coco Chanel and Helena Rubenstein; crime fiction from the 1930s and 1940s; famous, and infamous, women and whatever else may come to mind. 2:14 pm, 18 February, 2010 р. Your site is fascinating; I particularly enjoyed reading about Virginia Hill. As I’ve written about Bugsy Siegel and his time at Castillo del Lago, it was interesting to learn more about her life. 12:31 am, 15 August, 2010 р.
TCM got me to you site. As a B&W movie fan, your site is endlessly fascinating. 9:02 am, 2 May, 2011 р.
I have 3 pieces of vintage Coty cosmetic containers. Lipstick (Bright is on bottom) powder compact w/mirror and L’Aimant perfume. These container are very small (purse size) are brass trimmed in red. I will post pics on my Face Book page if you would like to see them. If you have any idea what they would sell for please let me know. Thanks! 9:54 am, 22 February, 2012 р. Rats! Wish I’d seen Felonious Flappers earlier as it would have been the bees knees to go ! Do you have a newsletter or any type of email notification so I won’t miss any upcoming events? Can’t wait to see more events on your calendar!